For the adjacent city, see Dujiangyan City. The Dujiangyan (Chinese: 都江堰; pinyin: Dūjiāngyàn) irrigation system was originally constructed around 256 BC by the State of Qin as a water conservation and flood control project. The system's infrastructure is located on the Min River (Sichuan) (Chinese: 岷江; pinyin: Mínjiāng), which is the longest tributary of the Yangtze, in Sichuan, China. The area is situated in the western portion of the Chengdu flat lands at the confluence between the Sichuan basin and the Qinghai-Tibet plateau. Originally the Minjiang rushed down from the Min Mountains, but slowed abruptly after reaching the Chengdu Plains, causing the watercourse to fill up with silt, making the surrounding area extremely prone to flooding. Li Bing, then governor of Shu for the state of Qin, and his son headed the construction of the Dujiangyan, which harnessed the river using a new method of channeling and dividing the water rather than simply following the old way of dam building. It is still in use today to irrigate over 5,300 square kilometers of land in the region. The Dujiangyan along with the Zhengguo Canal in Shaanxi and the Lingqu Canal in Guangxi are collectively known as the "three great hydraulic engineering projects of the Qin dynasty." Traditional levee made of long sausage-shaped baskets of woven bamboo filled with stones known as Zhulong, held in place by wooden tripods known as Macha. During the Warring States period, people who lived along the banks of the Min River were plagued by annual flooding. Qin governor Li Bing investigated the problem and discovered that the river was swelled by fast flowing spring melt-water from the local mountains that burst the banks when it reached the slow moving and heavily silted stretch below. One solution would have been to build a dam but Li Bing had also been charged with keeping the waterway open for military vessels to supply troops on the frontier, so instead he proposed to construct an artificial levee to redirect a portion of the river's flow and then to cut a channel through Mount Yulei to discharge the excess water upon the dry Chengdu Plain beyond. Li Bing received 100,000 taels of silver for the project from King Zhao of Qin and set to work with a team said to number tens of thousands. 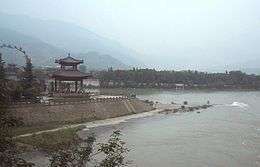 The levee was constructed from long sausage-shaped baskets of woven bamboo filled with stones known as Zhulong held in place by wooden tripods known as Macha. The construction of a water-diversion levee resembling a fish's mouth took four years to complete. Cutting the channel proved to be a far greater problem as the tools available to Li Bing at the time, prior to the invention of gunpowder, were unable to penetrate the hard rock of the mountain so he used a combination of fire and water to heat and cool the rocks until they cracked and could be removed. After eight years of work a 20 metres (66 ft) wide channel had been gouged through the mountain. After the system was finished, no more floods occurred. The irrigation made Sichuan the most productive agricultural place in China. On the east side of Dujiangyan, people built a shrine in remembrance of Li Bing. Li Bing’s construction is also credited with giving the people of the region a laid-back attitude to life; by eliminating disaster and ensuring a regular and bountiful harvest, it has left them with plenty of free time. Today, Dujiangyan has become a major tourist attraction. It is also admired by scientists from around the world, because of one feature. Unlike contemporary dams where the water is blocked with a huge wall, Dujiangyan still lets water go through naturally. Modern dams do not let fish go through very well, since each dam is a wall and the water levels are different. In 2000, Dujiangyan became a UNESCO World Heritage Site. On May 12, 2008 a massive earthquake struck the Dujiangyan area. Initial reports indicated that the Yuzui Levee was cracked but not severely damaged. The Yuzui or Fish Mouth Levee, named for its conical head that is said to resemble the mouth of a fish, is the key part of Li Bing's construction. It is an artificial levee that divides the water into inner and outer streams. The inner stream is deep and narrow, while the outer stream is relatively shallow but wide. This special structure ensures that the inner stream carries approximately 60% of the river’s flow into the irrigation system during dry season. While during flood, this amount decreases to 40% to protect the people from flooding. The outer stream drains away the rest, flushing out much of the silt and sediment. The Feishayan or Flying Sand Weir has a 200 m-wide opening that connects the inner and outer streams. This ensures against flooding by allowing the natural swirling flow of the water to drain out excess water from the inner to the outer stream. The swirl also drains out silt and sediment that failed to go into the outer stream. A modern reinforced concrete weir has replaced Li Bing's original weighted bamboo baskets. The Baopingkou or Bottle-Neck Channel, which Li Bing gouged through the mountain, is the final part of the system. The channel distributes the water to the farmlands to the west, whilst the narrow entrance, that gives it its name, works as a check gate, creating the whirlpool flow that carries away the excess water over Flying Sand Fence, to ensure against flooding. Anlan or Couple's Bridge spans the full width of the river connecting the artificial island to both banks and is known as one of the Five Ancient Bridges of China. Li Bing’s original Zhupu Bridge only spanned the inner stream connecting the levee to the foot of Mount Yulei. This was replaced in the Song Dynasty by Pingshi Bridge which burned down during the wars that marked the end of the Ming Dynasty. In 1803 during the Qing Dynasty a local man named He Xiande and his wife proposed the construction of a replacement, made of wooden plates and bamboo handrails, to span both streams and this was nicknamed Couple’s Bridge in their honour. This was demolished in the 1970s and replaced by a modern bridge. Erwang or Two Kings Temple is located on the bank of the river at the foot of Mount Yulei. The original Wangdi Temple built in memory of an ancient Shu king was relocated and so locals renamed the temple here in honour of Li Bing and his legendary son whom they had posthumously promoted to kings. The 10,072 m2 Qing Dynasty wooden complex conforms to the traditional standard of temple design except that it does not follow a north-south axis. The main hall, which contains a modern statue of Li Bing, opens up onto a courtyard facing an opera stage. On Li Bing's traditional birthday, 24th day of the 7th month of the lunar calendar, local operas were performed for the public, and on Tomb Sweeping Day a Water Throwing Festival is held. The rear hall contains a modern statue of the god Erlang Shen who was allegedly Li Bing’s son, but historic records fail to confirm this and it is possible that he was invented by locals to give their hero a descendent to maintain his family heritage. Guanlantin Pavilion stands above the complex and is inscribed with wise words from Li Bing such as, When the river flows in zigzags, cut a straight channel; when the riverbed is wide and shallow, dig it deeper. Fulongguan or Dragon-Taming Temple in Liudi Park was founded in the third century in honour of Fan Changsheng. Following Li Bing’s death a hall was established here in his honour and the temple was renamed to commemorate the dragon fighting legends that surrounded him. It is here that Erlang Shen, the legendary son of Li Bing, is said to have chained the dragon that he and his 7 friends had captured in an ambush at the River God Temple when it came to collect a human sacrifice. This action is said to have protected the region from floods ever since. During the East Han Dynasty a statue of Li Bing was placed in the river to monitor the water flow, with the level rising above his shoulders to indicate flood and falling beneath his calves to indicate drought. Recovered from the river in 1974 and placed on display in the main hall, this is the oldest known stone statue of a human in China. Wikimedia Commons has media related to Dujiangyan. ↑ Zhang, Kan; Hu Changshu (2006). World Heritage in China. Guangzhou: The Press of South China University of Technology. pp. 95–103. ISBN 7-5623-2390-9. ↑ "Dujiangyan Irrigation System". travelchinatour.com. Retrieved April 20, 2008. More than 2,000 years ago, Li Bing (c.250-200 BC) served as a local governor of Shu State. At that time, the Mingjiang River flowed quickly down from the mountains. As it ran across the Chengdu Plain, it frequently flooded the Chengdu agricultural area where local farmers suffered much from the water disaster. Li Bing and his son designed this water control system and organized thousands of local people to construct the project. ↑ China Heritage Project. "Taming the Floodwaters". The Australian National University. Retrieved April 22, 2008. Li Bing was commissioned to conduct an extensive hydraulic survey to regulate the unpredictable course of the swiftly flowing spring-thaw waters of the Min River that regularly flooded areas and settlements on the plains around Chengdu, and simultaneously ensure that the Min River flowed unimpeded through Chengdu, facilitating navigation by military vessels that could service Qin's logistical supply lines. ↑ China Heritage Project. "Taming the Floodwaters". The Australian National University. Retrieved April 22, 2008. By 270 BCE he had drawn up plans to mitigate the Min River's floodwaters for year-round irrigation on the Chengdu Plain and navigability to Chengdu. The original plan called for the construction of weirs or levees to harness the Min River at Dujiangyan, where the hills meet the Chengdu Plain, and of a diversion channel to irrigate the plain that would cut straight through the natural barrier posed by Mount Jian. ↑ "Zhulong". Dujiangyan Irrigation System Museum. It is also called Zhuluo, Zhulou, etc. which is a long sausage-shaped basket of woven bamboo filled with stones used to protect the riverbed or served as a dam. While the Dujiangyan Irrigation Project under the guidance of Li Bing, Zhulong was widely used. It was simple and cheap but effective and has been passed down from generation to generation. Even today it is still widely adopted in flood control. ↑ "Zhulong". Dujiangyan Irrigation System Museum. They are wood tripods used to support a temporary dam to cut off a river, control flood or regulate water, etc. They are one kind of flexible convenient and effective engineering facilities. ↑ China Heritage Project. "Taming the Floodwaters". The Australian National University. Retrieved April 22, 2008. In 268 BCE, Li Bing is said to have personally led ten of thousands of workers in the initial stage of construction on the Min River banks. The workers made bamboo cages and threw cages of rocks into the middle of the river. It took them four years to complete a water-diversion levee resembling a fish's mouth. When the water reaches Yuzui, the 'fish's mouth,' it is naturally diverted into the inner and outer flows. The inner flow is the diversion channel that leads to Chengdu. ↑ China Heritage Project. "Taming the Floodwaters". The Australian National University. Retrieved April 22, 2008. Prior to the invention of gunpowder, manual labourers using only drill rods and stone hammers would have taken 30 years to cut through the mountain. Qin military planners required more immediate results, so Li Bing proposed using the expeditious and simple technology of using controlled blazes to scorch the rocks and then dousing them with cold water. The seemingly limitless forest resources of the region at that time – evidence of which is provided by the Shu kingdom period tree trunk coffins recently unearthed in downtown Chengdu – made such an option possible. King Zhao of Qin allocated 100,000 taels of silver for the project. ↑ China Heritage Project. "Taming the Floodwaters". The Australian National University. Retrieved April 22, 2008. It took a further eight years to cut through the mountain, and the 20 metres (66 ft) wide culvert allows the water to flow into the Chengdu Plain. The key part of the project was the diversion gate called Baopingkou that resembles the neck of a bottle, and through this passage, the waters of the Min River could irrigate the Chengdu Plain in perpetuo. In 256 BCE, after 14 years of arduous labour, the Dujiangyan project was completed. That, at least is one received historical account, but it is undeniable that for more than two millennia this irrigation project has been in use on the Chengdu Plain. ↑ Lee, Don (February 8, 2006). "People's Party Animals". Los Angeles Times. Retrieved April 22, 2008. [Luo Xinben, a professor at Southwest University for Nationalities] and other scholars say Chengdu's laid-back culture was spawned by its 2-millennium-old irrigation system. ↑ Lee, Don (February 8, 2006). "People's Party Animals". Los Angeles Times. Retrieved April 22, 2008. [Tan Jihe, a researcher at the Sichuan Provincial Academy of Social Sciences] says Du Jiang Yan, and Chengdu's fertile soil and moist air, made it easy to plant rice, corn, potatoes and a rich assortment of citrus and other fruits, giving farmers not only good harvests but also plenty of time for leisure. ↑ Hornby, Lucy. "China quake weakens Sichuan dams, cuts off river". Relief Web. Retrieved 2008-05-14. ↑ Chen, Lydia. "Most historical relics survive Sichuan quake". Shanghai Daily. Retrieved 2008-05-14. ↑ "At The Fish Mouth Water-Dividing Dam". travelchinatour.com. Retrieved April 20, 2008. The Fish Mouth Water-Dividing Dam is built in the middle of the river. It is the main part of Dujiangyan Irrigation system. The Fish mouth functions to divide the river into an inner canal and an outer canal. Long ago, when Li Ping worked as the local governor of the Shu State, he found the old river canal was too narrow to hold much water, which often overflowed the banks and caused disastrous floods. Based on natural geographic conditions, Li Bing organized the people to build a man-made dam. The whole dam looks like a fish, and the front dam has a circular cone shaped like a fish mouth. ↑ "At The Fish Mouth Water-Dividing Dam". travelchinatour.com. Retrieved April 20, 2008. It is the dam that diverts water into the outer canal and the inner canal. The inner water canal functions as the main stream for irrigation purposes; the outer river is mainly used to drain excessive water and sand. During flood seasons the inner canal holds 40 percent of the water in the river, and 60 percent of the water flows into the outer river. It is vice versa in dry seasons. About 80 percent of the silt is carried away along the outer river. ↑ "At the Flying Sand Fence". travelchinatour.com. Retrieved April 20, 2008. The water flows along the inner canal towards the Bottle-Neck Channel. On the way it passes the Flying Sand Fence, which has a 200-meter-wide opening from south to north. The Fence joins the inner and outer canals. The fence functions to control the flow of water and discharge excess into the outer canal from the inner canal. ↑ "At the Flying Sand Fence". travelchinatour.com. Retrieved April 20, 2008. During the dry seasons the fence doesn't work much, but when floods occur, the river rushes forward along the inner canal. As it approaches the fence, the river begins to turn fast, and soon many whirlpools are formed. The whirlpools change quickly, swee-ping away sand and pebbles, and throwing them into the outer canal. During the flood seasons, this spillway transports 80 percent of the sediments into the outer river, and at the same time excessive water flows over the Flying Sands Fence into the outer river. In ancient times, there was no cement in use. Instead, huge bamboo cages were used as the fence. They were filled with stones and pebbles. However, at present, a reinforced concrete weir has replaced the ancient fence. ↑ "At the Bottle-Neck Channel". travelchinatour.com. Retrieved April 20, 2008. The inner canal leads to the Bottleneck Channel, which is the entrance of the extensive irrigation system. A trunk canal cuts the mountain into two parts. The small part was later called Li Dui, which means an isolated hill. Chengdu looks like a large bottle, and the trunk canal between the mountain and the hill takes the shape of a bottleneck. During the flood seasons, the water will not overflow into the trunk canal. Instead, it flows in whirlpools into the outer canal. The trunk canal works as a check gate to safeguard the Chengdu Plain. ↑ "Anlan Bridge". Dujiangyan Irrigation System Museum. The bridge is 261 meters long across both the inner river and the outer river. It was called Zhupu Bridge in ancient times and was rebuiltin the Song Dynasty and called Pinshi Bridge. In the late Ming Dynasty(1368-1644), it was burned in a war. In the 8th year of Jiaqing Reign(1803 A.D.) of the Qing Dynasty, He Xiande,a native, and his wife proposed rebuilding it and as a result the people on both banks could cross the raging waves in safety, hence it was called Anlan Bridge and also called Couple Bridge at that time. ↑ "Anlan Suspension Bridge". travelchinatour.com. Retrieved April 20, 2008. Anlan Suspension Bridge is one of the five ancient bridges in China. The total length is 320 m. Its ancient name was called the Rope Suspension Bridge or the Bamboo and Cane Suspension Bridge. Unfortunately, a fire caused by war towards the end of the Ming dynasty destroyed the original bridge. In 1803, a new bridge was built. It was made with local bamboo rope chains, and the bridge bottom floor was replaced with wooden plates. The old bridge lasted until the 1970s when it was replaced by a steel chains bridge. ↑ "Two Kings' Temple at DuJianYan". travelchinatour.com. Retrieved April 20, 2008. Erwang (Two King's) Temple was built to commemorate Li Bing and his son. Erwang means two kings. Originally, the temple was called Wangdi Temple in memory of Duyu, the king of the ancient Shu. Later Wangdi Temple was relocated in Pixian county during the Southern and Northern Dynasties. Local people renamed the temple Chongdemiao to express respect for Li Bing and his son. Chongde means worship of virtue or reverence. During the Song Dynasty the temple was called Wangmiao, which means the king's temple. Down to the Qing Dynasty it was called Erwang Temple. People offered Li Bing and his son the posthumous title of Wang (king). ↑ "Two Kings' Temple at DuJianYan". travelchinatour.com. Retrieved April 20, 2008. The temple complex occupies an area of 10,072 square meters. the ancient timber buildings remain similar in design and style to other ancient Chinese architecture. The broad roof, perfect decoration, strict size and traditional use of color meet in harmony with the mountaintop environment. However, the temple buildings are not placed based on the concept of the north-south axis. ↑ "Two Kings' Temple at DuJianYan". travelchinatour.com. Retrieved April 20, 2008. The main hall is devoted to Li Bing himself. The statue is newly molded. The old statue was a larger-than-life painted statue, and the figure looked like a wise scholar looking at the rushing river below. The newly molded figure has a silk map in his hand, and appears to be thinking about the blueprint of the project. ↑ "Two Kings' Temple at DuJianYan". travelchinatour.com. Retrieved April 20, 2008. According to Folk tale, July 24 of the Chinese Lunar Calendar is Li Ping's birthday. On that day many local people visit the temple where they prostrate themselves before the image of Li Ping and his son and burn incense to honor them. At the same time, the beatings of drums and gongs resound to the sky as incense smoke curls upwards. ↑ "Two Kings' Temple at DuJianYan". travelchinatour.com. Retrieved April 20, 2008. Li Bing's hall is a compound. The hall faces an opera stage across the courtyard below, surrounded by other buildings. On July 24 of the Chinese Lunar Calendar during the Ming and Qing dynasties entertainers performed local operas on the stage. People gathered in the courtyard to watch the performance. Legend says the actors offered the performance mainly for Li Bing, as tribute for his great contribution to local people. ↑ "Two Kings' Temple at DuJianYan". travelchinatour.com. Retrieved April 20, 2008. The rear hall is devoted to Li Bing's son. His son's statue is newly molded. The figure stands firmly with a tool in his hands as ready to level mountains. Behind the statue is the Minjiang River, which serves as the background. Li Bing's son had a name called Erlang. ↑ "Two Kings' Temple at DuJianYan". travelchinatour.com. Retrieved April 20, 2008. Erlang is a popular legendary figure in Chinese folk literature. In the folk stories, he has a close relationship with Li Bing. It should be pointed out that no recorded historical evidence could be found to show Erlang was Li Bing's son. In Chinese feudal society, it was a great problem for a family to have no offspring, so local people regarded Erlang as Li Bing's son. They sincerely wished Li Bing would have a son so that Li's family tree would continue. ↑ "Two Kings' Temple at DuJianYan". travelchinatour.com. Retrieved April 20, 2008. There is a delicate pavilion called Guanlantin. Carved characters are on both sides of stonewalls. 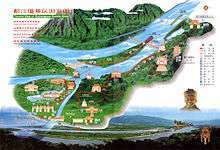 These are quotations of how to manage the Dujiangyan Irrigation System. One of the famous inscriptions engraved on the wall is an eight-character quotation from Li Ping. It says: When the river flows in zigzags, cut a straight channel; when the riverbed is wide and shallow, dig it deeper. ↑ "On the way to Fulonguan (The Dragon-Taming Temple)". travelchinatour.com. Retrieved April 20, 2008. The Dragon-Taming Temple is located in the beautiful Lidui Park, which is close to the city. It was built in the 3rd century. Originally, it was devoted to Fan Changsheng, the founder of Tianshi Dao, one Daoist sect in the Jin Dynasty (265-420). During the Five Dynasties and Ten States, Li Bing was conferred the posthumous title called Da'anwang, and his hall was set up here in honor of him. A popular legend during the Song Dynasty was that Erwang, Li Bing's son, had subdued an evil dragon here. So the temple was renamed as the Dragon-Taming Temple accordingly. ↑ Cheng Manchao (1995). The Origin of Chinese Deities. Beijing: Foreign Languages Press. pp. 170–180. ISBN 7-119-00030-6. ↑ "On the way to Fulonguan (The Dragon-Taming Temple)". travelchinatour.com. Retrieved April 20, 2008. In 1974, a stone statue of Li Bing was unearthed from the river base. The carved figure looks graceful. Now it is placed in the middle of the main hall. It is 2.9 m in height and 4.5 tons in weight. Based on archeological studies, the statue was carved in 168 during the East Han Dynasty. ↑ Wintle, Justin (2002). The Rough Guide History of China. London: Rough Guides Ltd. p. 78. ISBN 1-85828-764-2. ↑ "Dujiangyan Irrigation System Tour, Travel Guide", Retrieved on 10 dec 2005.